‘Number 11, Dukes Square, looks just like the other houses on the Brighton seafront: a Regency terrace with elegant sash windows, a winding staircase, and post piled up in the hall for its tenants. It might be part of the city's history, but it's also a place of brand new beginnings. Lucy Diamond has written some fantastic novels with The Beach Café being one of my favourite books in this genre in recent years. 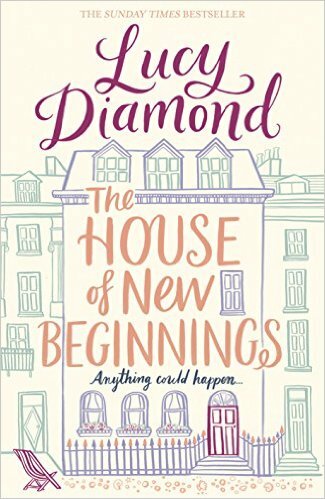 I was very happy to have to the opportunity to receive an early copy of her upcoming novel, The House of New Beginnings, for review. 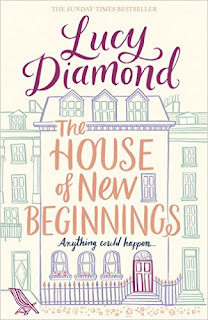 After looking at the cover and synopsis, memories returned of some fantastic novels I’d read by other authors which explore the lives of different tenants (Marian Keyes and Lisa Jewell, to name two) and I hoped this novel would be equally as enjoyable. It didn’t disappoint. It may only be January but I loved this book so much I just know it’s going to end up as one of my favourites of 2017. I found this novel to be uplifting, charming, moving, and thought-provoking. Anyone who has lived in a shared house or building will know how easy it can be to shut your own door and never really get to know the neighbours despite your proximity. And behind every door is a different story, a different history. In this novel, we explore Charlotte, Georgie and Rosa’s stories. I loved every character equally so the narrative switching between the three tenants worked for me. They were the perfect mix of characters for the novel. There was sadness, resentment, but also lust for life in these characters, and I loved how they came together. There are also several other engaging characters (including other tenants) that play important roles in the novel and help Charlotte and Rosa to break the monotony of their quite isolated lives. I particularly enjoyed the character of Georgie and her adventures trying out and reporting back on local events. There were some definite laugh-out-loud moments. The elderly tenant whom Charlotte befriends is also just amazing and I was very moved by their intertwining stories. A fantastic novel for 2017, I couldn’t put it down. This book sounds really good. Thanks for the recommendation and review!